Every cosmic phenomenon deserves its own unique claim to fame, but Abell 2052 deserves better than this. Its gas jerks back and forth like a drink sloshing around in a glass. It's like the cosmic equivalent of a tipsy uncle. The gravitational attraction of the smaller cluster drew the hot gas out of the central cluster toward the smaller cluster. Once the smaller cluster passed by the central cluster core, the gas movement reversed and it was pulled back toward the center of the main cluster. The hot cluster gas overshot the cluster center, creating the "sloshing" effect that is like the sloshing that occurs when a glass holding a liquid is quickly jerked sideways. 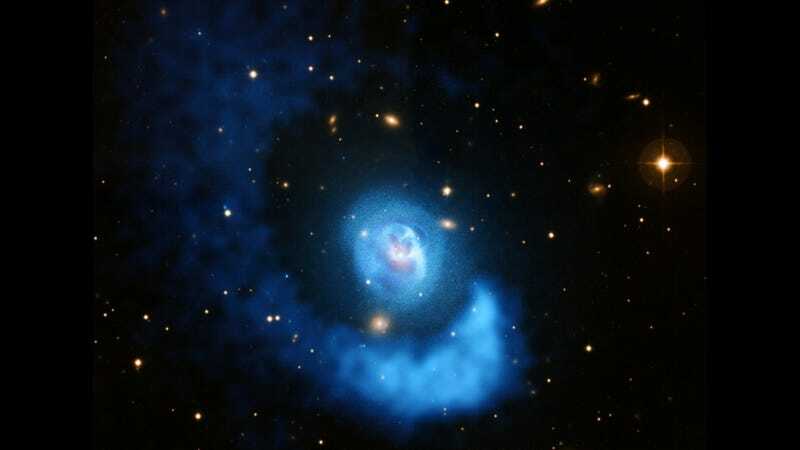 In the cluster, gravity pulls back on the gas cloud, creating the spiral pattern. All this sloshing by Abell 2052 might look a bit embarrassing, as though it's trying and largely failing to stagger home after a wild night with all the other galaxy clusters or something, but this weird movement serves some pretty key purposes. For one thing, the sloshing helps move gas away from the core, where it can cool down to a relatively cool 5.5 million Kelvin. This keeps the core of the galaxy nice and hot, which in turn means fewer stars will be able to form. Via the Naval Research Laboratory.